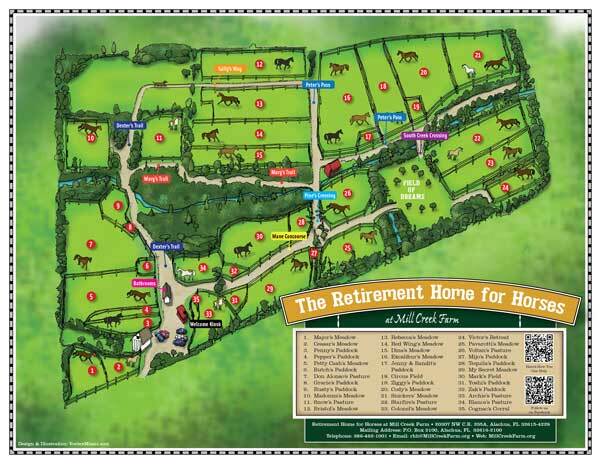 [/vc_column_text][vc_empty_space height=”20px”][/vc_column_inner][vc_column_inner width=”2/3″][vc_column_text]The Retirement Home for Horses at Mill Creek Farm in Alachua, Florida commissioned Vortex Communications to create a trail map for visitors. This 335 acre non-profit farm is home to over 100 rescued and retired horses. As part of the farm’s outreach program, families are invited to come visit the farm and hike along a series of trails that connect pastures, native woods and wetlands on the property. As a way to engage visitors of all ages, the client wanted to have a fun lighthearted design that adults and children would enjoy using to explore the farm. Vortex agreed that a hand-drawn illustration would allow for a more fanciful rendition of the property. Vortex anticipated having to make changes and revisions along the way, so they created a series of rough sketches for approval and then moved to ink when the design was approved.